For French rivers called Orne, see Orne (disambiguation). Orne (French pronunciation: ​[ɔʁn]) is a department in the northwest of France, named after the river Orne. Orne is one of the original 83 departments created during the French Revolution, on 4 March 1790. It was created from parts of the former provinces of Normandy and Perche. 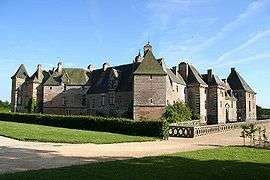 Orne is in the region of Normandy neighbouring Eure, Eure-et-Loir, Sarthe, Manche, Mayenne, and Calvados. It is the only department of Normandy to be landlocked. 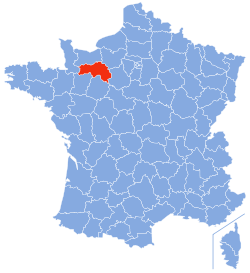 The largest town by a considerable margin is the prefecture, Alençon which is an administrative and commercial centre for what is still an overwhelmingly rural department. There are no large industrial centres: agriculture remains the economic focus of Orne. The inhabitants of the department are called Ornais. The recorded population level peaked at 443,688 in 1836. Declining farm incomes and the lure of better prospects in the overseas empire led to a sustained reduction in population levels in many rural departments, and by the time of the 1936 census the recorded population stood at just 269,331. Once motor car ownership started to surge in the 1960s employment opportunities became less restricted and by 2008 the population level had recovered a little to 292,282. The two major cities in the Orne are Alençon, the prefecture, and Flers. Alençon is the chief town of the Orne department. Camembert, the village where Camembert cheese is made, is located in Orne. The local dialect is known as Augeron.